In December 2013, I visited The Lost Gardens of Heligan on a cold and rainy afternoon. In some parts of the garden I was alone with the gardeners, who were absorbed in various tasks. In the Vegetable Garden, a few of them were digging over the bare soil. Others were walking along the paths, carrying hand tools and talking about their day’s work. It was a timeless Winter scene and for a moment, the past and present seemed to converge. As I watched, I felt as if a window in time had opened to reveal the direct continuity between the contemporary gardeners and those who had created the gardens we know today. The 21st century gardeners were doing the same jobs and taking the same pride in their work as their historic counterparts had done. In fact, today’s gardeners hold the legacy of Heligan in their hands. This profound connectedness between Heligan’s contemporary gardeners and those who went off to War in 1914 was the inspiration for The Gardeners of ’14. During 2014, I visited Heligan several times to photograph the gardeners at work. I used black-and-white 120 film and shot all of the photos with a plastic-lens Holga camera, in order to give the images a timeless feeling. Most of these photos are candid and informal: they show people raking, watering, planting and weeding. 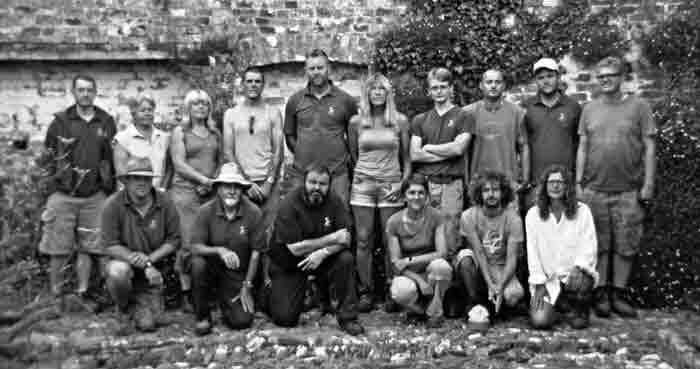 But I also took a formal group portrait of the gardeners (above), which was inspired by an early 20th century photo of the Heligan estate staff. 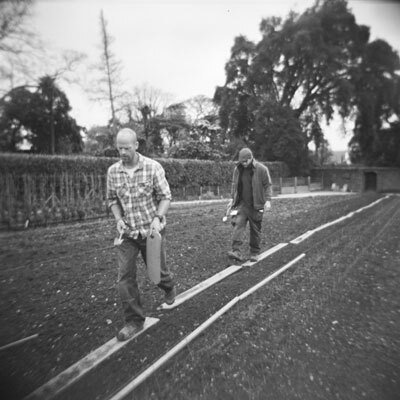 Along with the photographs of the gardeners, my partner, Phil Atkin, and I recorded audio clips of the team as they went about their daily tasks. 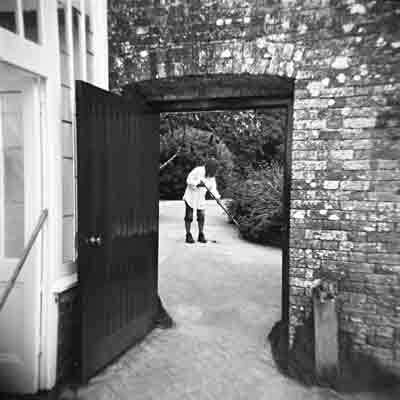 That audio was edited to create a soundscape of a working day at Heligan. Again, the sounds were selected for their timelessness, e.g., the crunching of gravel, snippets of conversation, bird song and running water. Although most of my work took place in the background so as not to interfere with the gardeners’ daily tasks, one aspect of the piece brought us together as co-creators. Early in the project I asked the gardeners to choose a site which is not open to the public: an equipment store or similar space that was theirs alone. On a Summer morning in 2014, the team gathered in that space. 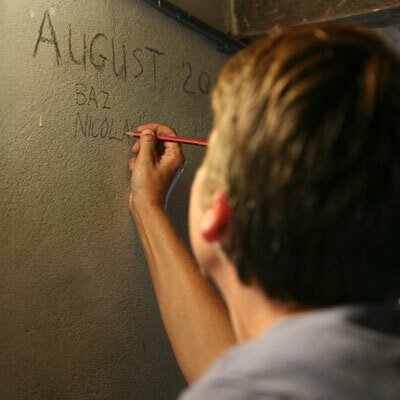 One of the gardeners was selected (by his colleagues) to write ‘August 2014’ on the wall in pencil. Then the others took turns signing their names below the date. 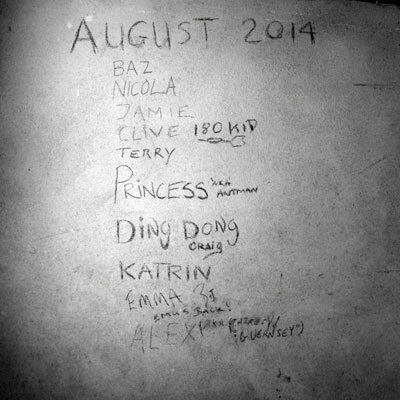 This inscription was planned as the 21st century equivalent of the Thunderbox Room, to serve as an informal record of the gardeners of August 2014. The final list of names is not necessarily complete or even legible — the fact that it exists (and will exist for an unknown number of years) is the only thing that matters. 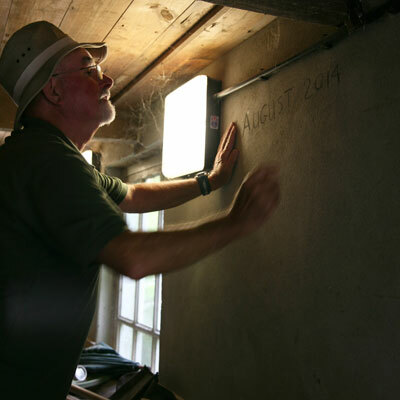 I was privileged to be present at the creation of the inscription, which is being maintained and preserved for the future by today's gardening team. 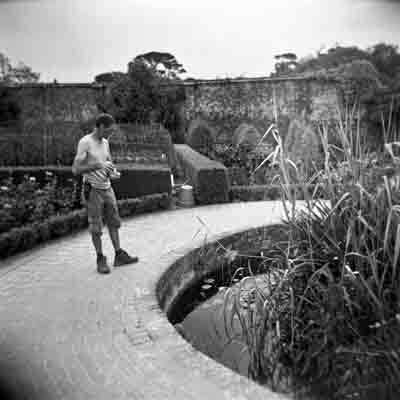 The Gardeners of ‘14 was exhibited at The Lost Gardens of Heligan in Autumn 2014. The installation was designed to look as if it was a collection of the gardeners' own photos, taken over a period of years. The finished multimedia piece consisted of black-and-white Holga images in vintage frames accompanied by a quiet ambient soundscape. The Gardeners of ‘14 shared space in the Melon Yard Lean-to with the beautiful Harvest displays created by the gardeners themselves — a fitting culmination to a truly collaborative project. My aims with this piece were twofold: first, to inspire people to think about the relationship between the past (in this case, the First World War), the present and the future. But I also intended The Gardeners of ’14 to be a statement about the fragmentary nature of knowledge. In our daily lives we are all archaeologists, reconstructing people and events from scraps and snippets of ‘reality’. Like any historic record, The Gardeners of ’14 is both incomplete and biased, and it is open to many interpretations.